설명 앨범의 일흔 일곱 사진을 걸어 주위"MT-55Bridgelayer"
의 사진 갤러리 MT-55Bridgelayer, The MT-55A (Slovak: Mostný tank) is an armoured vehicle-launched bridge (AVLB) tank, manufactured by ZTS Martin in Slovakia. 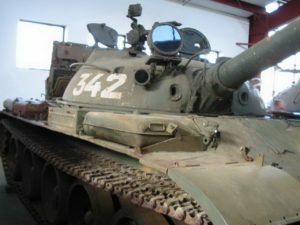 The AVLB is based on a T-55A medium tank chassis, with the turret detached and replaced by a special bridge launching equipment. The MT-55A was produced for the armies of the Warsaw Pact (including the Soviet Army), as well as for export clients.